Here is a small flowering examples on our new product: the pearly gaucho. When it comes to leather and textiles services, Pro'peaux has been providing quality service through production, quality and diversity of materials for over 20 years. 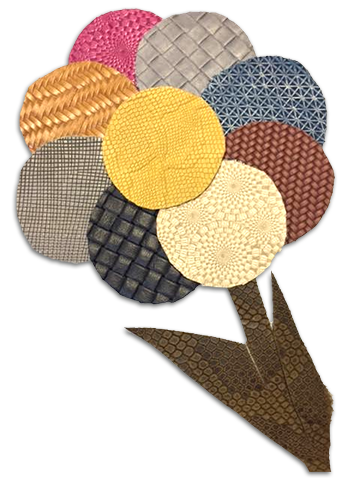 Since it’s creation, Pro’Peaux, located in Paris, France, has been both producer and distributor of Leather and Material Skins. The skins we sell, consistently approved by our technical department before distribution, are primarily aimed at a very large clientele of high profile brands in the sectors of luxury leather goods, handbags, belts and other accessories. Pro’Peaux’s many years of experience in luxury leather goods, handbags and accessories has naturally led to a presence in footwear and apparel. Our concept of providing quality and responsive service is an integral part of how we function no matter the sector of service we provide. We are regularly pursuing new markets for our ever-growing product line. Pro’Peaux has become an important ally for major luxury brands in France as well as internationally. We now cover five major continents. The constant development of new products enables PRO’PEAUX to have more flexibility with the constant demand of new market trends and offer the widest choice of finished leather. Pro’Peaux has often become a laboratory of ideas for brand designers who come and work in our vast showroom. Pro’Peaux is committed to providing excellent customer service and is honored to use our network of established relationships with suppliers to meet any client demand, even on short notice. We are confident with our years of experience and dedicated team, we can uphold our excellent service with rigor and enthusiasm.